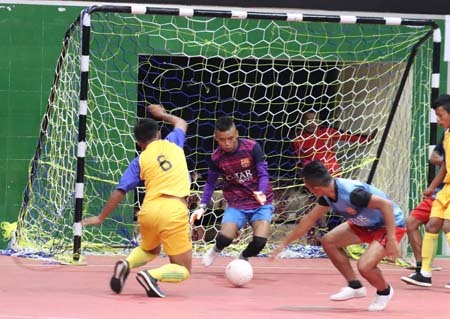 The Futsal Association of Meghalaya (FAM) is all set to organize the 2nd Open Futsal Tournament from September 25 to 29 at the Indoor Sports Stadium at Laban in Shillong. Meanwhile, the Association has appealed to all stakeholders – government, companies, clubs, sport associations, individuals – to support the event and to promote the game as support from all quarters will help them to take part in the Futsal tournament at national level. The Association has invited teams which may be localities, institutions, clubs, organizations, etc to participate in this tournament to support and promote Futsal. Limited teams will be registered and it would be on first come first serve basis, informed the organizers. Registration forms can be obtained at Rubok Sports at Motphran, Sports Spirit, MUDA complex at Police Bazar and US-Dollar Departmental Store at Laitumkhrah in Shillong. Registration of participating teams will be from September 3 to 18, 2018. Before the tournament, the Association will organize a one-day pre-tournament clinic about Futsal and the rules of the game to the participants. Date and venue of the clinic will be notified later on, the organizers added. Notably, the 1st Open Futsal Tournament held in Shillong last year was a grand success.